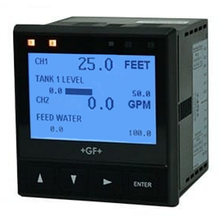 The GF 9950 Dual Channel Transmitter operating on DC power with Relay module, 2 mechanical and 2 solid state relays. ​The sensor types supported by the 9950 are Signet Flow, pH/ORP, Conductivity / Resistivity, Salinity, Temperature, Pressure, Level, Dissolved Oxygen, and devices that transmit a 4 to 20 mA signal with the use of the 8058 iGo® Signal Converter. The +GF+ 9950 houses some advanced features such as derived functions, advanced multiple relay modes, and timer based relay functions. Derived functions lets the operator simply control a relay or current loop with the sum, delta (difference), or ratio of two measurements. Three different signals can be used for the control of a single relay using a combination of both analogue and also binary inputs. Weekday timer mode allows a relay to be energised on exact days of the week at any chosen time, with a separate function of also scheduling every minute or once every 30 days. The 3-9950.393-3 Relay Module includes the ability to interface up to four binary inputs. The binary inputs are compatible with either open collector or mechanical contacts. The binary inputs can supply power to the four inputs or accepts powered outputs from external devices. These inputs can be used with level switches, flow switches, pressure switches or other devices, all available from iCenta Controls. The inputs can be used to directly control the relays of the unit or can be used in conjunction with the measurement readings for advanced control of your process.